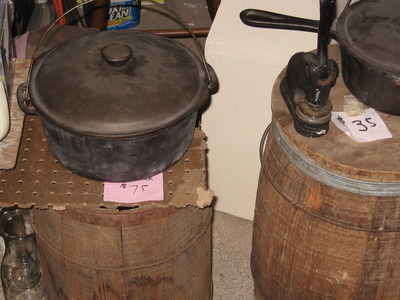 Cast iron kettles, wood ironing board, glassware and games, clam forks, picnic basket $35, Sawyers viewfinder, $40. Small farm tools, wood barrels and boxes, old trunk. Hand tools, manual slide projector w/slides. Hand lawnmower $50. Horse harness and support equip, other misc items. Call for prices and/or photos. All prices are negotiable. Make an offer.